The full download has all 18 pictures in it (1.95Mb) or a cut-down version with just 8 of the photographs (0.99Mb). Lotus cars upto the mid 1970s are featured (no wedge Elites or Eclats, sorry! 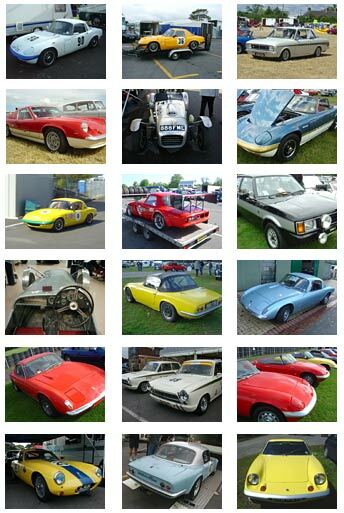 ), including the early days of the Six and Seven, through to the Elan (fixed head and open), Elan Sprint, Europa (inc Gold Leaf Team Lotus edition), Elan Plus 2, and Elite. Cars powered by the twin-cam Lotus engine built by other makers also feature, such as the Lotus Cortina and Sunbeam Talbot Lotus. Later Lotuses will feature in a future version. If you're not too confident with changing your PC settings in this way, it is probably best to get someone who knows more about this kind of thing to do it. It has been tested on my own PC (running Windows XP) and works ok with Internet Explorer 6.0 and Firefox 1.0 browsers. No guarantees, warranties or anything else that it'll work on every new or ancient PC out there! I can't take responsibility for anyone re-configuring their Windows settings by trying this - however it should be fine, but it does require a little knowledge by the user to install it.